Get the most complete data available anywhere on the 5.8 million + U.S. Healthcare Providers. Physicians, practice groups, hospitals, clinics, nurses, technicians, pharmacies, pharmacists, dentists, optometrists – every type of healthcare provider in America is here. This is the database that brings all of the available information on U.S. HIPAA-covered healthcare providers together in one relational database on your desktop or laptop computer. The CPAC+EPGH bundle contains complete NPPES, The Centers for Medicare and Medicaid Services (CMS) maintains this database. All healthcare providers who are HIPAA covered entities must obtain a National Provider Identifier (NPI) by reporting their information via the NPPES, and updating it when it changes. This represents virtually all of U.S. physicians, hospitals, and other providers who accept insurance or are associated with a hospital. LEIE List of Excluded Individuals/Entities (LEIE): The federal database maintained by the HHS Office of Inspector General containing information on providers who have been barred from billing Medicare due to fraud or controlled substance conviction, patient neglect or abuse, and other reasons. 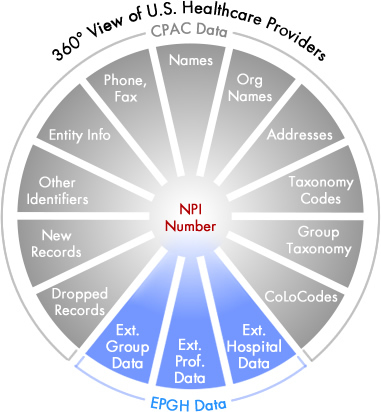 CarePrecise uses a proprietary record-linking system to attach active NPI numbers. and PECOS The federal database containing information on healthcare providers who are eligible to bill Medicare (Provider Enrollment, Chain and Ownership System). information on all of the 5.8 million + U.S. healthcare provider records*, plus data extracted from millions of Medicare health insurance claims to create our database of physician practice groups linked with their practitioners – all merged into one easy-to-use relational database for Microsoft Access, SQL, FileMaker, or any other PC, Mac or Linux database or CRM software, and ready to use immediately. You just can't find a more complete database of U.S. healthcare providers with their practice groups and hospital affiliations. The bundle includes our Extended Professional, Group and Hospital (EPGH) dataset, and our CarePrecise Access Complete (CPAC) dataset, giving you the most comprehensive view of the U.S. healthcare provider landscape available anywhere. The basic information, including practice and mailing addresses, phone numbers, fax numbers, specialties/taxonomy codes, license numbers, Medicare numbers and more, is enhanced with information on individuals (medical school, graduation year, multiple practice locations, practice group affiliations, hospital affiliations), plus information on the practice groups, and extended hospital data, putting the full 360 degree view of U.S. healthcare providers right on your desk. TIP: Add the Authoritative Hospital Database, and you'll have patient satisfaction data, medical procedure volumes, bed counts, and much more. At a price made possible by advanced data collection technology. Our data is constantly being refreshed with new source data, using our proprietary advanced record collection and linking technology, QoRelate™, making CarePrecise the leading provider of the most comprehensive, up-to-date and affordable medical provider database. The pricing below is for the single-user edition. If you want to use CarePrecise data within a product such as a website, additional licensing options are available; contact Sales at (877) 782-2294 extension 9. The current release is dated April 16, 2019 . If you produce mobile or other web-based applications that need accurate healthcare provider data, CarePrecise has the data package and redistribution license to fit your app, your business model, and your traffic level. Contact Sales at 877-782-2294 extension 9 for information about our CarePrecise Developer Kit (CPDK) and redistribution licensing. Our separate file of rich data on deactivated providers since 2005 includes the date of deactivation, name, address, specialties - all of the same fields as the standard data on current providers. Get the data plus our CP ListMaker software to make it easy to create lists and Excel spreadsheets of specific provider types and locations for your particular needs. Description CPAC includes all U.S. healthcarte providers. * EPGH adds extended data on physicians, practice groups and healthcare professionals, and hospitals. the blue section for EPGH fields) CPAC database plus EPGH extended data, with our powerful list-building softwareRequires Microsoft Access. For additional options, see the full CarePrecise Access Complete/CarePrecise Platinum and Gold lines in our online store. Compare all of our major products on the Product Comparison page. The CPAC+EPGH Bundle and CarePrecise Platinum offer the ability to easily pull an accurate list of medical providers of any specialty in any zip code, city or state, a list of hospitals and their affiliated physicians or practice groups, or a list of practice groups and view a verified list of medical professionals affiliated with the groups – or many other specialized lists as your need requires. Hospital data includes the Medicare CCN number used to link to federal hospital quality and patient satisfaction data. The physicians data includes links to physician quality data soon to be released by CMS. Addresses and other data are verified and in regular use in the healthcare industry for provider insurance reimbursements, research, and federal and state incentive programs. View the Product Comparison page for pricing of the full range of CarePrecise healthcare provider databases and subscriptions. Legacy identifiers, including UPIN, and other identifiers, including Medicare PIN, NSC, OSCAR. 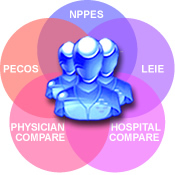 The data contained in the CarePrecise combined NPPES, PECOS, LEIE, PhysicianCompare and HospitalCompare database is used throughout the healthcare industry. Standing as the only fully NPI-keyed, complete dataset on U.S. healthcare providers, our users include health plans, healthcare product and service vendors, healthcare standards and quality organizations (such as NCQA), law enforcement, government agencies, medical software makers, and marketers. State RHIOs, health information exchanges, state medicaids and the Federal Bureau of Investigation are among CarePrecise data users. Purchase a quarterly or monthly subscription to receive the completely updated database. We provide features to let you know which records have been dropped, which have been added, and which have had changes in the data. The Single Download option includes 30 days of free Phone Technical Support. Subscription options come with 90 days of free Phone Technical Support. See support details. For operation as a Microsoft Access database, Access 2007 or later is required. CSV files can be imported into any ordinary database system such as FileMaker, MS-SQL, MySQL or SQL Server, SalesForce, SugarCRM or other CRM. You should have 2 gigabytes of RAM (4GB recommended) on your laptop or desktop computer. The CSV files may be imported into any application that supports comma separated value files and supports large file sizes, on Windows, MAC and Linux computers. 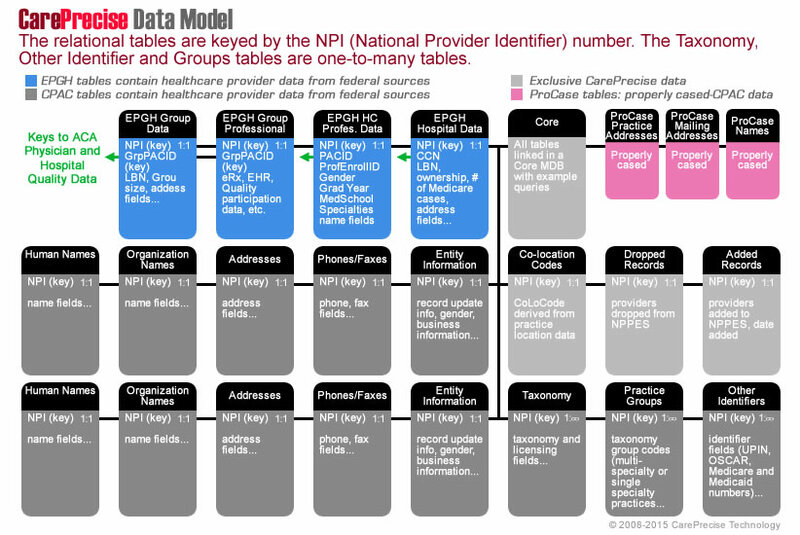 The CPAC+EPGH Bundle and CarePrecise Platinum products are distributed as normalized relational database tables (MDB files), each keyed by the National Provider Identifier (NPI) number, plus a core Microsoft Access database that links the files together and includes query examples, tables that identify added, dropped and deactivated provider records, and CSV versions of the files. Through data normalization, CarePrecise reduces more than 380 highly redundant flat-file fields in the multiple databases to less than 90 unique fields, removing large volumes of unused space while preserving every character of the data and all of the original granularity. The data is in no other way abridged, but is ready to access at a fraction of the original file sizes, and in a form that can readily be searched, manipulated and imported into applications, all relationally linked by the unique NPI number. * Includes 100% of current U.S. HIPAA-covered healthcare providers, including physicians, dentists, nurses, technicians, clinics, hospitals, and every other type of medical provider. 100% of records are updated monthly. 100% of records include address, phone and specialties. Approximately 65% of records include fax numbers. View current counts on our Provider Counts page.